What did we get up to at Turn2us? The last month has certainly been an eventful and enjoyable one for the Turn2us volunteering team. 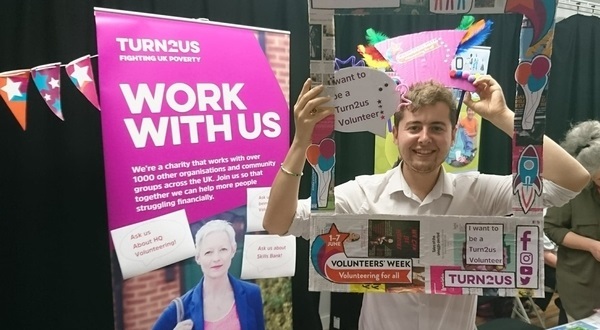 Volunteers’ Week ran from 1-7 June with the theme being ‘Volunteering for all’. Not only did we want to thank our existing volunteers for all their hard work, we also wanted to meet new people and encourage them to volunteer with us. We kick-started the week by sending out a thank-you video from Turn2us staff to our volunteers. It was great to have every Turn2us team represented, all keen to give their sincerest thanks. We had a great deal of fun making it! We also attended volunteer fairs in Hammersmith and Barnet where we met lots of enthusiastic people looking for their next volunteer role. Any opportunity for us to get out there and spread our message is extremely welcome. These fairs are a wonderful way to find great people who are interested in what we do. The admiration for what our volunteers do and how long they’ve done it for was a constant theme - from potential new volunteers and other organisations. We ended the week on a high as Turn2us staff and volunteers joined forces on Lyric Square in Hammersmith to tell our local community how they can get involved. With a big team out and about in bright purple Turn2us t-shirts, armed with leaflets and information, we certainly made an impression. Plenty of people took leaflets for themselves and others. They displayed genuine interest in volunteering and spreading the word about our work. Let’s hope we get lots of enquiries in the coming weeks. We would like to thank everyone who took part in the celebrations and our volunteers for their amazing work. Last year, Turn2us volunteers gave us over 2,400 hours of their time! Let’s look forward to an even brighter year for volunteering and an even bigger Volunteers’ Week in 2019.